My New Personal Saturn Doll! I Made A Saturn Doll, And You Can Too! Step1- If you have one of DiC's Sailor Mars Dolls, get another one. If you don't have one, get two (Hey! I don't want to deface Rei-chan!). If you have two already, make sure that one of them has the tall boots and doesn't have the "sparkling new outfit" (where do they get this stuff?) The 6" kind is the best for this mission. Step2- Now that you have the Mars doll described above, find a clean surface, some sissors and a newspaper or plastic bag. Spread the paper on the surface. Step3- Cut Rei's hair about half way, making sure it's over the paper. Step4- Continue to snip until the desired Hotaru length is obtained. TAKE YOUR TIME! There's nothing worse than a bad hair cut that won't grow out! Step5- Go to a craft or fabric store and get some dark purple fabric paint (unless you have some already) The stuff can be kinder expensive at times, so just by a tiny/small amount. Use it to colour the red skirt, collar, choker, boots and elbows Rei-chan left behind, then let it dry. Step6- Find something white that you can cut up (The white left over from the DiC stickers would help our cause, and it works great) Cut into a little spikey star and stick it on the locket, then make a smaller one for the choker. Step7- If you're really into details, take to her ears with white out(But be careful!) and if you can think of a safe way to spike the sleeves, go for it. Step8- I know what you're thinking: "How the heck is she going to pull off the Glaive?" Well, this is the part when we send letters of praise to DiC. You see, they made a Queen Beryl doll! If you don't have one, get one. If you do, put her stick in Hotaru's hand(see why 6" is better?). And if you want it white, white it out. Step9- Viola! 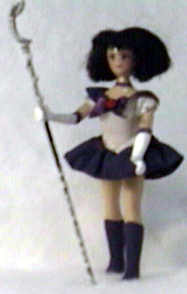 You are looking at a fully equiped Sailor Saturn "Adventure Doll"! Find a nice place to call home. If her hair seems too fluffy for your liking, wrap an elastic around her head, and leave it there for about two days. After you take it out, brush it twice, and things are looking great!